US and Philippine ships during Cooperation Afloat Readiness and Training (CARAT) Philippines 2014. 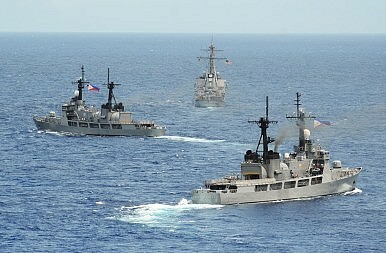 US official offers an update on the Southeast Asia Maritime Law Enforcement Initiative. The United States has been boosting aid to four Southeast Asian states amid continued Chinese assertiveness in the South China Sea, a U.S. official told journalists Thursday evening. According to William R. Brownfield, assistant secretary at the bureau of international narcotics and law enforcement affairs, the Southeast Asia Maritime Law Enforcement Initiative – initially announced by Secretary of State John Kerry in December 2013 – had now grown to $100 million with funding from all parts of the U.S. government targeted at four ASEAN states: Indonesia, Malaysia, the Philippines, and Vietnam. “This initiative at this time constitutes more than $100 million of United States assistance for maritime law enforcement to these four nations from all sources,” Brownfield said. The $100 million figure represents a sum that has built on the assistance that Kerry had announced back in 2013, which was an additional $32.5 million that had intended to take total U.S. maritime security assistance to the region above $156 million over the next two years. The nature of the support, Brownfield said in fleshing out the initiative, comprises construction, infrastructure, equipment (including vessels), training and capacity-building, and support for greater regional cooperation and coordination. The initiative, he added, was partner-driven and maritime law enforcement-focused, though Washington was prepared to cooperate with any element of governments involved in such activities and would welcome the participation of other international donors as well. In Vietnam’s case for example, Brownfield said while fielding a question, the government had requested construction of additional training facilities, additional maintenance and support facilities for vessels, and assistance with capacity-building, including help with ensuring compatibility and interoperability. “We have agreed and we are working closely with the Vietnamese Coast Guard in terms of providing and assisting them in developing that capacity and capability,” he added. In addition, Brownfield confirmed that, as I reported for The Diplomat last month, Vietnam had expressed interest in strengthening cooperation with the U.S. Coast Guard, which Admiral Paul Zukunft, the Commandant of the U.S. Coast Guard, had welcomed. “I can tell you with absolute certainly…that the United States Coast Guard welcomed that closer cooperation and we look forward to the two institutions, both of which have a proud tradition of enforcing the laws in their maritime waters,” he said. Having just returned from a trip to three of the four countries involved in the initiative – Malaysia being the exception – Brownfield said he had noted improvements in capabilities in all three cases. “[M]y observation is at least in Indonesia, Vietnam, and the Philippines, their capability for greater and more effective maritime law enforcement in their maritime domain is better today than it was two years ago,” he said. Despite continued concerns about China’s rising assertiveness in the South China Sea, Brownfield repeatedly refused to be drawn into issues of sovereignty and maritime borders that he said were beyond the scope of the initiative. He did, however, restate the U.S. government position of three basic principles to govern sovereignty issues there: no additional land reclamation; no militarization; and no new construction. These principles, he noted, were the same ones that governed ASEAN’s own approach to the issue. He also admitted that the strengthening of Southeast Asian states’ maritime law enforcement capabilities would potentially enable them to address other issues as well. “I do acknowledge logic and common sense will tell you that a nation that is better able to enforce its maritime laws will be better able to address other issues as well,” he said. White House highlights US efforts as Obama kicks off Asia trip.